This week's deliveries were all made with crafted intention of both flavor and nutrition. One of the items we try to address that don't seem to grab enough attention is the importance of a healthy gut microbiome. The gut is the foundation of all health in which food, emotions, stress, and laughter all play a major role. You can eat all the kale you want, but without having healthy gut, all those nutrients will not be absorbed. 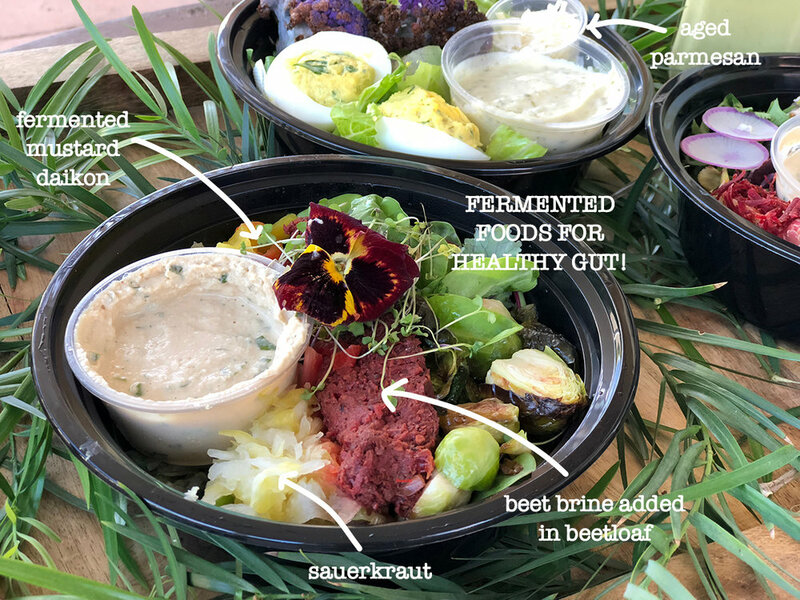 You will notice that in our meals, we try to incorporate fermented foods that are loaded with healthy bacteria, called probiotics. Natural sources are the best so we find it very crucial to implement fermented foods into our meals. We have a close working relationship with Happy Pantry's owner/chef, Mark who provides us with fermented ingredients including brine and special fermented items for us to use. We also make our own kimchi and fermented chili pastes. We hope you notice the little things and extra efforts we put in our meals to make it the most healthy and happy for you!